Let’s add a user account for yourself and configure this account so it has the same administrative access as the default administrator account. Go up to the Dockbar, mouse over Go to and click Control Panel. Then open the Users and Organizations page under the Portal category. Click the Add button and select User. Fill out the Add User form using your name and email address. When you are finished, click Save. After you submit the form, the page reloads with a message saying the save was successful. An expanded form appears that allows you to fill out a lot more information about the user. You don’t have to fill anything else out right now. Just note that when the user ID was created, a password was automatically generated and, if Liferay was correctly installed (see chapter 14), an email message with the password in it was sent to the user. This, of course, requires that Liferay can properly communicate with your SMTP mail server. If you haven’t yet set up your mail server, you’ll need to use this page to change the default password for the user ID to something you can remember. You can do this by clicking on the Password link in the box on the right, entering the new password in the two fields and clicking Save. Next, you should give your user account the same administrative rights as the default administrator’s account. This allows you to perform administrative tasks with your own ID instead of having to use the default ID. It also helps to make your portal more secure by deleting or disabling the default ID. Click the Roles link. 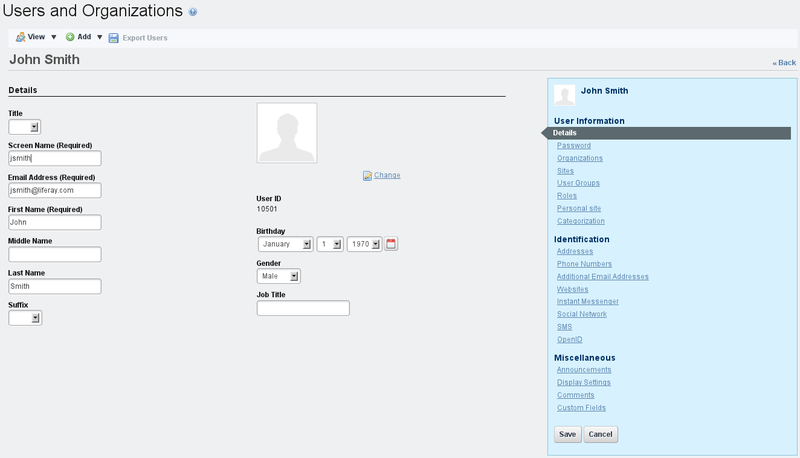 The control panel’s Roles page shows the roles to which your ID is currently assigned. You should have one role: Power User. By default, all users are assigned the Power User role. You can give this role certain permissions if you wish or disable it altogether. You can also define the default roles a new user receives. We’ll see how to do this later. To make yourself an Administrator, click the Select link. A dialog box pops up with a list of all the roles in the system. Select the Administrator role from the list. The dialog box disappears and the role is added to the list of roles associated with your account. Next, click the Save button, which is at the bottom of the blue bar of links on the right. You are now an administrator of the portal. Log out of the portal and then log back in with your own user ID. We’ll next look at some aspects of user management.